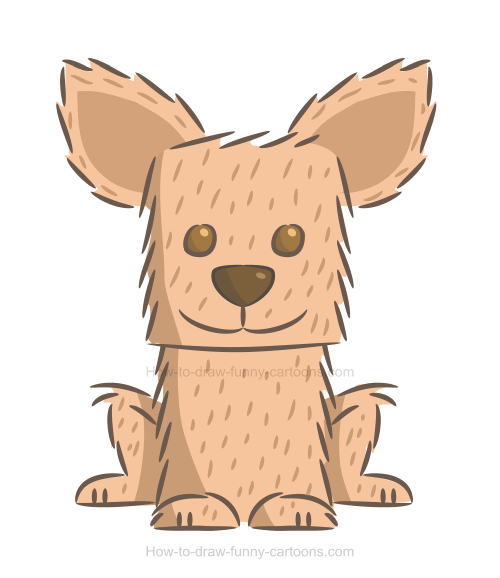 Learn how to create a chihuahua illustration that is cute, adorable and made from irregular lines and shapes. Chihuahuas are fun animals that are often depicted with large ears, small eyes and wearing a bow near the top of the head. These cute little dogs are known for barking a lot and being slightly aggressive despite the fact that these animals are small and not very frightening. 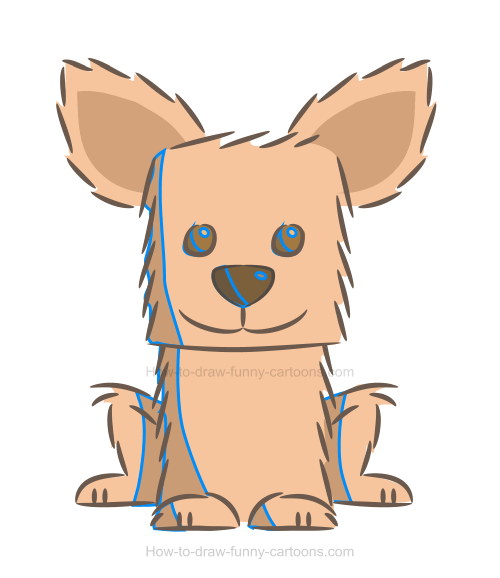 In this lesson, I will show you how to draw a chihuahua using small pointed lines, plain colors and irregular shapes. 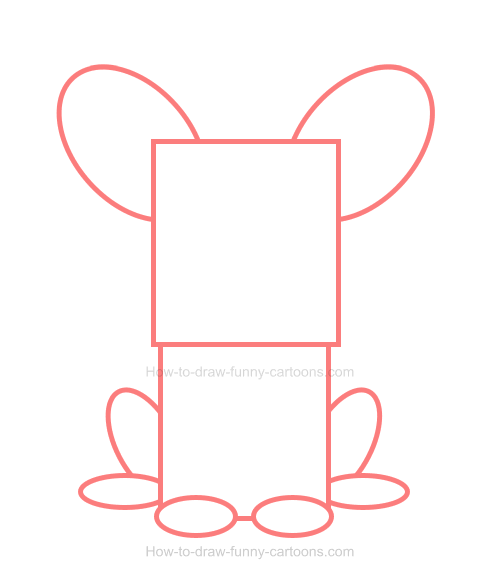 First, let's draw a template using several basic shapes to help us create accurate proportions. You can begin by adding a large head made from a square. 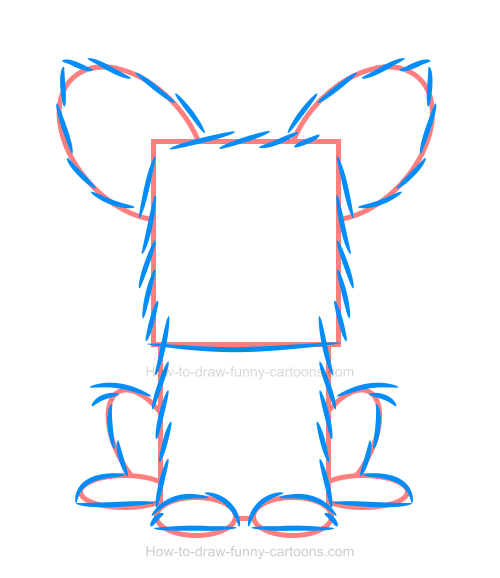 You can also draw the body using another square that must be slightly smaller than the one used for the head. The ears are done using large oval shapes. Finally, you can sketch the front legs and back ones using several small oval shapes as shown in the illustration below. Excellent! 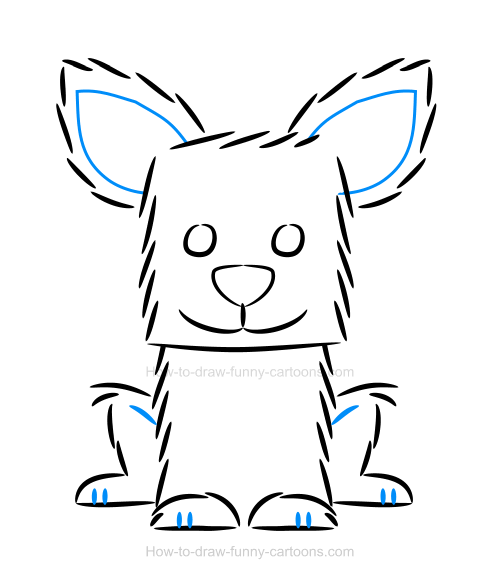 We now have all everything we need to sketch this chihuahua illustration. Simply draw small curved lines around all shapes created previously to complete this step. Notice how some lines are slightly longer in areas like the tip of the ears and near the knees. Good! Inside the head, draw both eyes using curved lines. The nose can be big and also done from irregular curved lines. Complete this step by creating a mouth using even more lines. Good work! 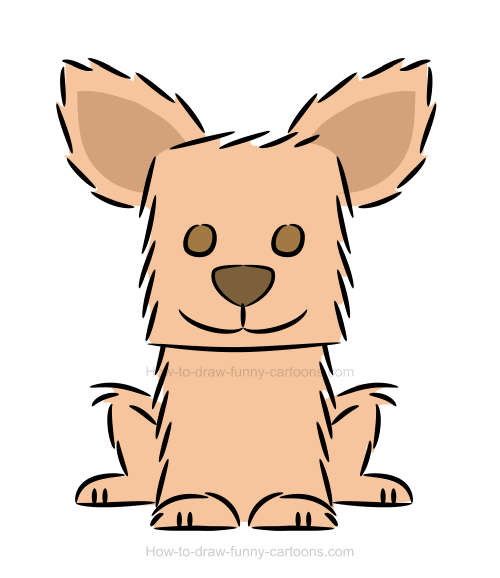 Only a few details are needed to conclude this part on how to draw a chihuahua. Inside the ears, draw large patches using long curved lines. Then, you can add more details inside the legs and the feet using a bunch of small lines. Excellent! We can now proceed with adding simple plain colors inside this cartoon chihuahua. It's hard to described the selected color, but let's just say it's a bright brown color that is slightly saturated. The patches found inside the ears are darker. The pupils and the nose are filled with a dark brown color. Black outlines are great, but adding colors instead is even more appealing. In this example, all lines were filled with a dark brown color instead of the original black color found in all previous steps. The character seems friendlier and kind of softer. No need to add complex digital effect to create something nice. Just a few shadows made using plain shapes can be enough. These new shadows were added inside the eyes, the pupils, the nose, the head, the body and the legs. Small circles used to depict reflection were also added inside the nose and the pupils. 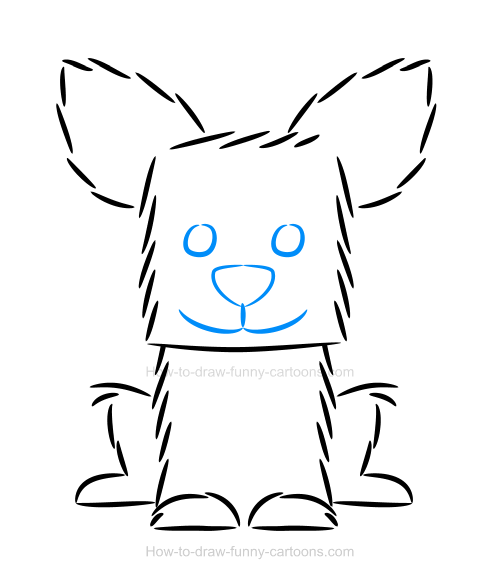 One easy technique to create texture is to sketch a few lines on the cartoon chihuahua to illustrate fur. No need to be precise since our goal is to create a chihuahua that looks warm, friendly and imperfect. 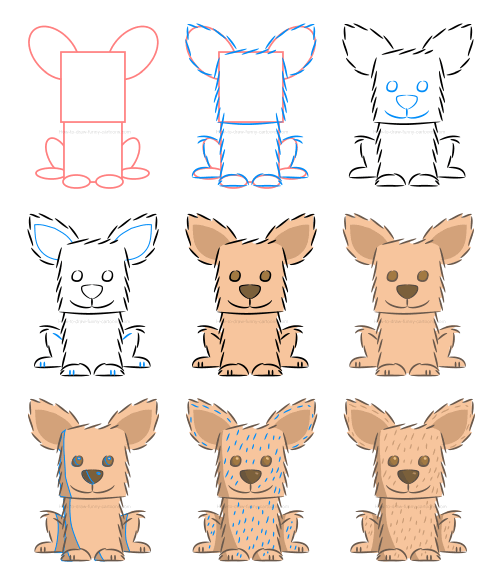 Once all lines are filled with the proper color, you can see how the final chihuahua illustration should look like. Yes! That's pretty much it for this lesson on how to draw this adorable animal.